As Hurricane Florence continues to intensify, this mighty, category 4 storm is expected to strike the east coast of America on Thursday. 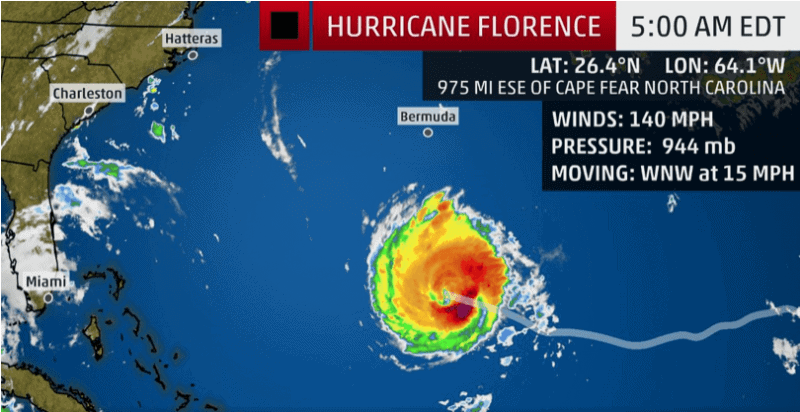 The Weather Channel reckons that Hurricane Florence is likely to hit with a “life-threatening storm surge, destructive winds and massive inland rainfall flooding in one of the strongest strikes on record for this part of the East Coast.” Our thoughts and prayers are with everyone being evacuated and those who will continue to be affected by this powerful storm. We’ve compiled a list of hurricane safety tips to avoid drinking contaminated water. If you live in the East Coast threat zone, now is the time to firm up your hurricane preparedness plan and be ready to implement it if necessary. Residents in coastal areas should follow evacuation orders from local officials because of the potential for life-threatening storm-surge flooding. Hurricane Florence status as of 5:00 AM EDT on Tuesday September 11, 2018. Hurricanes have devastating effects on every aspect of the lives of the people in their wake. Unfortunately, drinking water contamination is one of the most significant dangers in the aftermath of a hurricane. That’s why we’ve put together hurricane safety tips to help you and your loved ones from drinking contaminated water after Hurricane Florence. in 2017, Hurricane Harvey devastated the Gulf of Texas, leaving a billion-dollar disaster in its aftermath. Shortly after, Hurricane Irma touched base on Barbuda, narrowly missed Cuba, and finally unleashed its full fury on Southern Florida. Hurricane Maria rode on Irma’s tail and has left apocalyptic devastation levels in Puerto Rico. And experts warn that this could only be the tip of the iceberg as far as hurricanes go. As climate change affects the sea levels and average temperature of the planet, not only is the impact of hurricanes growing worse, but our hurricane risk is steadily on the rise too. Following a hurricane, a number of water contamination issues can and do arise. This is especially true of strong hurricanes such as Hurricane Harvey (2017), Hurricane Irma (2017), and even especially Hurricane Katrina (2005). And unfortunately, Hurricane Florence is expected to cause significant damage and potential for loss of life too. Trillions of gallons of rainwater cause severe flooding during a hurricane. This is worsened by the ocean storm surge levels. So what happens to water quality when we see rainfall and storm surge flooding leading up to, during, and after a hurricane? Water contamination. Coliform Bacteria (present in the feces of humans and warm-bloodied animals) showed varying levels of 57,000 CFUs, 43,000 CFUs, and 45,000 CFUs from three different sampling points. CFUs are Colony-Forming Units, the estimated number of bacteria cells with multiplying ability in a sample. Escherichia Coli (E. coli) – a toxin-producing coliform strain, and therefore part of the above figures – were specifically found in varying levels of 8,600 CFUs, 3,700 CFUs, and 6,300 CFUs. The drinking water standards for E. coli levels as per the EPA are zero, and even recreational water standards are as low as 100 to 410 CFUs. Heavy metal water contamination can also be expected. Because flood water picks up and becomes contaminated with anything below it, pesticide water contamination is also a very real threat in many areas following a hurricane. While the water tested will predominantly affect residents coming into physical contact through wading, it also affects drinking water. Sewage treatment plants are a major concern, as these facilities are largely affected by hurricane-related flooding (see previous section). Pipes can be broken when trees are uprooted, the force of the washout, or any other local structural damage. Basements and garages are also awash with other toxic substances that are then carried in the flood water. Public water utilities may be subject to the flooding and the water similarly contaminated. The facilities may be damaged, or residue left on the working parts that contaminate the water being treated at these plants. Private wells aren’t safe from the effects either, unfortunately. There are a host of risks involved in coming into contact with, and especially drinking, contaminated water following a hurricane. It is important to follow hurricane safety tips to protect yourself from water contamination. Any flooding, whether hurricane-related or not, drastically increases the spread of waterborne diseases: Cholera, hepatitis A, typhoid fever, and leptospirosis. These are the four of the most common diseases you can expect to be spread by water contamination. Water-related vector-borne diseases are also expected to be on the rise following any flood, especially when hurricane-related. Examples include dengue and dengue hemorrhagic fever, yellow fever, malaria, and West Nile Fever. Vomiting and diarrhea are another two common effects of drinking water contamination, and there have even been fatal cases in the past. Because the bacterial count in hurricane flood water is so high (see previous sections), physical contact is just as dangerous as drinking contaminated water. Skin infections alone are a very serious threat, especially if you have any cuts or open sores. With cuts and open sores, the risks increase even further. Infections, intestinal problems, an upset stomach, and flu symptoms can be expected. While these risks are present even when your skin is unbroken and unblemished, the likelihood of infection increases astronomically with something as small as a paper cut. Last year Hurricane Maria, which rode on the tail of Hurricane Irma, caused significant devastation in Puerto Rico. The situation was so bad that the mayor of San Juan, Carmen Yulín Cruz, described the logistics as “something close to a genocide”. Food, water, and fuel levels were all drastically affected, and Major Cruz pleaded repeatedly for assistance. In Dorado, citizens filled plastic containers with relief water provided by the authorities. But what hasn’t been made public knowledge right away was that this water is sourced from a hazardous-waste site that was federally designated in 2016. The Dorado Groundwater Contamination Site was the most used water source for many residents, who travel to the site to fill their containers. Large trucks are also being used to distribute the water to citizens who cannot collect themselves. The water contamination levels at the Dorado Groundwater Contamination Site aren’t entirely known. In 2015, the EPA declared it to be within the safety levels for chloroform and PCE, and they intend to do new tests shortly. The Water Quality Association has released hurricane safety tips that included a guideline for treating water following Hurricane Harvey. All of the points listed in the guideline are highly applicable for residents affected by Hurricane Florence and other hurricanes as well. To help you stay safe, we’ve included these safety tips for hurricanes and tried to go into more detail as well. We strongly recommend that you save a copy of these hurricane safety tips for present and future use. As hurricanes can affect power supplies (as we saw in Puerto Rico), an additional hurricane safety tip is that it would be advisable to keep a printed copy as well as bookmarking this post in your browser. Residents in areas affected by hurricanes should rely on bottled water for drinking and cooking, at least until you know for sure that your tap water is safe again. The flooding of municipal water utilities and private wells, as well as the effects of power shortages on the filtration facilities, often have long-term affects. While bottled water has its own list of dangers, following a hurricane’s effect on water contamination the risk factor is incredibly minimal in comparison. You should be aware that the costs of bottled water leading up to and following a hurricane do rise, as the supply-and-demand relationship is heavily affected. Residents with private wells should be especially careful of relying on their water source. As mentioned earlier, private wells are heavily affected by flooding during and after a hurricane. Unfortunately, municipalities do not regulate the water conditions of private wells, and resources such as the EWG Tap Water Database cannot give you any information on the contamination levels of private wells. It is therefore your responsibility (to yourself and others in your household) to perform regular tests on your water quality to determine when it will be safe to make use of your private well again. Appropriate remedies should be implemented as soon as possible. Water and Health have a fantastic resource on disinfecting private wells. Because of the disruptions to municipal water utilities, including their filtration facilities, officials often issue Boil Water Orders. WQA also have a great resource on Boil Water Notices, which you can download as a PDF and print. If you’re not sure how best to treat your water with the boiling method, see our below section, where we’ll discuss important considerations and give a step-by-step guide. If you have any water treatment equipment already, such as a faucet filter, counter-top filter, or whole house filter, it is highly recommended that you inspect this equipment to determine whether it too has been contaminated. Water filtration is incredibly important, especially following a hurricane, but if your filter has been compromised then it won’t be doing you any good to use it. Tying in with point number 4, the WQA and Premiere Sales alike strongly recommend implementing a water filter in your home, especially following a hurricane. As mentioned, water filtration is going to be imperative during this time! The scary thing is, even after your tap water has been declared legally safe, it still won’t meet the health guidelines. Implementing a whole house filter, or even a smaller tap water filter that fits under your sink or on your counter, is going to be a long-term investment. To close off, we want to give you an actionable guide on boiling your water following a hurricane. It is important to note that boiling your water will certainly kill contaminants such as bacteria, viruses, and parasites, but won’t necessarily have any effect on fuel or other toxic contaminants. This is why we once again strongly recommend making use of a household water filter as well. Reverse osmosis is a particularly powerful water purification method that we strongly recommend. Let the water stand so that the particles causing it to appear cloudy will settle first. Alternatively, you can also run it through a coffee filter, paper towel, or a clean cloth to filter it. Separate the clear water (draw it out if you’ve let the particles settle) and bring it to a boil. It’s best to do this on a stove top, as you’ll need the water to boil for at least one minute. Let the water cool before storing it in a clean, sanitized container with a tight cover. On the other hand, if your water is already clear, then you won’t need to let it settle or run it through a coffee filter, etc. before bringing it to the boil. You’ll still want to keep it at a rolling boil for at least a minute before letting it cool and storing it, however. Boiling your water as a purification method is strongly recommended following a hurricane especially. But as mentioned, it is limited in terms of what contaminants are removed. That’s why we also strongly recommend making use of a proper water filtration device. If you already have one, please remember to get it properly assessed after a hurricane to ensure that it has not been compromised by the flooding. 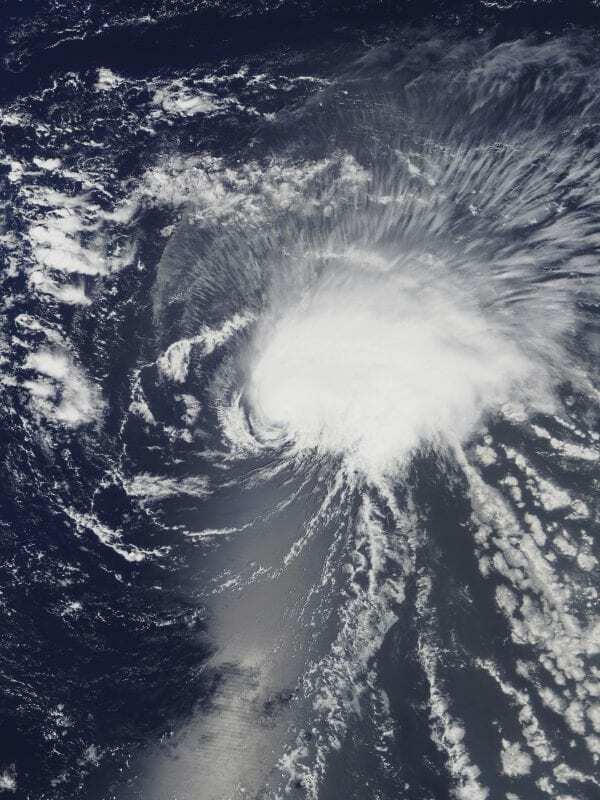 This entry was posted in Drinking Water, Health, Water Contaminants, Water Issues, Water News and tagged drinking contaminated water, hurricane safety tips, safety tips for hurricanes, water contamination.